Adding garage storage cabinets into your garage storage design planning is a great idea for the mechanic or craftsman that needs closed storage for expensive tools and equipment that he/she wants kept out of view. An added advantage is that some of the cabinet units available are lockable so that you can keep sharps such as chisels, bits, cutting blades, etc. out of reach from small children and locked away from prying eyes that may covet special tools. Locating the garage storage cabinets in the general garage storage scheme has a number of variables that revolve around how you use the workbench zone area of your garage. 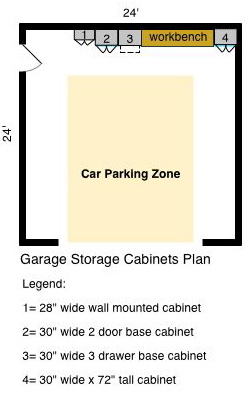 The Garage Storage Cabinets Plan at the left shows how you could layout the cabinet arrangement for a typical 2 car garage. In this case we have chosen to place the cabinets on each side of the workbench, but there are endless possibilities as to how you can successfully arrange these depending upon your own garage storage needs and usage. 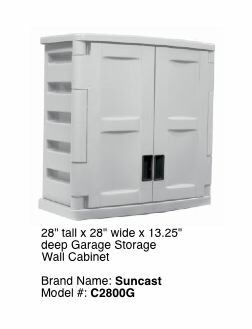 The Garage Storage Cabinets Plan shows the cabinets in gray tone and each is numbered to correspond to the Legend shown below it that describes what type of cabinet is being used. The product items shown below are in the same order as what we show in the legend above. The products shown below are available in both gray and biege color tones. The gray tones are designated with the letter "G" at the end of their model number. Cabinet #1, shown at the right, is a wall-mounted 2 door upper cabinet with one adjustable shelf that can hold up to 50 pounds. It is constructed of durable resin and plastic that resists rusting, fading and peeling. It features lockable doors and is ideal for storing paint supplies and/or tools up off the floor. This cabinet requires easy snap-together assembly (about 15 minutes) and comes in the color gray/beige with black/blue handles. As a wall-mounted cabinet unit, the bottom of the cabinet should be located at about 4' 6" above the finished floor below it. You should follow the manufacturers recommendations/instructions for mounting the cabinet to the wall structure. Cabinet #2, shown at the left, is a 2 door base unit that sits on the floor, or could be wall-mounted slightly above the floor if you have a uneven or out-of-level garage floor. It has 2 adjustable shelves that will each carry a load of up to 75 pounds. It is constructed of durable resin and plastic that resists rusting, fading and peeling. It features lockable doors and is ideal for storing paint supplies and/or tools or other supplies that need to be locked away. The top makes for extra storage next to your workbench surface and is an ideal extension when working on a project around your home. This unit comes in gray/beige with black/blue trim and handles. Cabinet #3, shown at the right, is a 3 drawer base unit that sits on the floor, or could be wall-mounted slightly above the floor if you have a uneven or out-of-level garage floor. 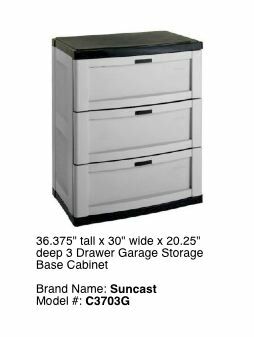 This garage storage cabinet has small roller-glides on each drawer for easy of operation. Each drawer capacity is equivalent to 14 gallons. It is constructed of durable resin and plastic that resists rusting, fading and peeling. This unit features a lockable drawer system to keep small children out of the content area of the drawers. The top makes for extra storage next to your workbench surface and is an ideal extension when working on a project around your home. This unit comes in gray/beige with black/blue trim and handles. This unit makes a nice functional addition to any garage workbench area. 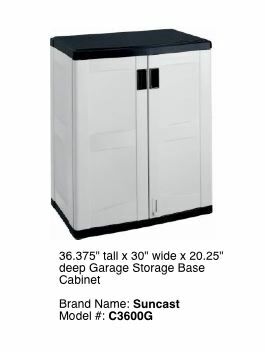 Cabinet #4, shown at the left, is a 2 door tall storage unit standing 72" high and is an ideal addition to your overall garage storage systems plan. This unit is designed to sit on the floor and can be leveled with shims placed under the four corners of the cabinet if your floor is uneven or out-of-level. This cabinet features 4 adjustable shelves that will each carry a load of up to 75 pounds and is lockable. It is constructed of durable resin and plastic that resists rusting, fading and peeling. It allows for 25.0 cubic feet of storage and accommodates long handled items easily. Hanging hooks can be fastened to the inside walls for hanging-up yard trimmers, hedge trimmers, etc. This unit comes in gray/beige with black/blue trim and handles and requires easy snap-together assembly. All hardware is included to accomplish full assembly. If you are planning a garage makeover and your garage storage ideas have not included garage storage cabinets in the overall scheme, we recommend that you give strong consideration to one or more of the cabinets shown on this page. They make a great addition to any garage storage plan in the way of functional, durable and attractive garage storage solutions, and may cause your friends and neighbors to exhibit garage-envy when visiting. If you are not finding what you are looking for, use our customized search engine below. We want you to find the answers and products you are seeking for your garage storage needs.